The beginning of the year is an especially attractive time to think about career growth. However, it’s important year-round to be intentional about your career and the ways in which you want to develop, grow and improve. Goal setting is an important component of intentional growth and development. Don’t overlook this valuable activity. When you set professional goals, you intentionally and thoughtfully considering what you want for yourself. You think deliberately about your future and what you want it to look like. Rather than letting it happen to you, you take an active role in how it evolves. When setting your professional goals, think about both your immediate and longer-range professional goals. Imagine where you want to grow and develop in the short and longer term. You may have a very clear idea of how you want to grow within the company or your career. If so, setting goals will likely be easier. If you don’t, then assess areas of weakness that you’d like to strengthen and those that will be most beneficial in your career. What areas do they see as most valuable, and how can you contribute to that? What areas can you target for improvement over the year? Allow them to share information on what they find valuable. Gain insight into their thoughts about where you might best focus on improvement. Let them know that you’re focused on growth, which will hopefully gain their support in this endeavor. This activity lets them know you’re interested in growth. It also shows that you want your growth to be in-line with what will provide value to the organization, while also providing professional benefit to you. Many employees don’t make the effort to actively pursue career growth, especially while considering the benefit to the organization. This will set you apart from others. SPECIFIC: Be specific and clear about what you want to accomplish. If your goal is vague, you’ll not know what you’re working toward exactly. MEASURABLE: Make your goal measurable so that you’ll know when you’ve reached it. ACHIEVABLE: Set goals that you can reach within the target timeframe. RELEVANT: Set goals that are consistent with your overall vision and plan. Set goals that are congruous with your values and dreams. TIME-BOUND: Set goals that you can accomplish within the timeframe you’ve established. To give you a better idea of what professional goal setting looks like in real life, let’s walk through an example of setting a SMART goal relevant to improving your project management skills. For our example, let’s pick one from this list and focus on making improvements in that area for the year. As an added benefit, many of these translate to other career roles as well and can serve you well outside of project management. From this list, let’s select “improving leadership skills” as a target area in which you choose to improve. To set SMART goals around leadership, you need to determine specifically what areas of leadership you want to focus on, since leadership itself is a broad area. You might determine that one leadership area you most need and want to focus on is improving communication since this is also a trait listed for great project managers as well. o Read 2 books on improving communication skills. o Incorporate active listening techniques during interactions with others. o Give full attention to others when speaking with them, and not engaging with my mobile phone while others are speaking to me. o Reduce the number of times I interrupt co-workers and peers. Measurable: Within six months, I will have improved my communication skills and gotten positive feedback from my boss and peers that my communication skills have improved. Achievable: This is achievable within six months. Relevant: Improving communication skills will be valuable to the team and to me professionally. Because there is a great deal of collaboration needed across our team and communication is critical for both productive output and team cohesion, this goal is beneficial for the team. Additionally, it is valuable for me professionally since communication skills are critical for project management success. Time-Bound: I will have completed this goal within six months. Improving my communication skills will benefit me professionally and support the team’s need for collaboration and cohesion. I will improve my communication skills by reading 2 books on communication skills, incorporating active listening, and improve respectful interactions by not interrupting and listening fully when others speak. Within six months, I will have improved my communication skills and gotten positive feedback from my boss and peers that my communication skills have improved. Goal 2: I will improve my presentation skills. Specific: I want to be able to create and give presentations effectively to various audiences. In order to improve my skills, I will need to both create and give presentations to various audiences at different management levels. Measurable: Within six months, I will have created and presented PowerPoint presentations to at least three audiences. These presentations will be relevant to our team’s projects and will include charts and graphs conveying relevant information. I will have given this presentation verbally to both peers and managers at least three times within six months. Relevant: Improving presentation skills will be valuable to the team and to me professionally. Because our team regularly needs to share information about our projects with multiple audiences, this skill will be valuable to the team. Additionally, it is a valuable skill for me professionally and will be useful going forward as I move forward in my career. Improving my presentation skills will be valuable to both the team and to me professionally as I move forward in my career. I will do this by creating and giving a PowerPoint presentation including charts and graphs conveying relevant project information. I will share this presentation verbally to both peers and managers at least three times within six months. There’s a lot of value in setting SMART goals. Especially if you’ve not been setting goals at all previously. However, one area I’ve recently been contemplating is the aspect of “Achievable”. Not long ago I read and wrote about the 10X Rule by Grant Cardone. Cardone advocates setting extremely high goals. He suggests that if you want normal levels of success, set common goals. If you want to really level-up, you need to set goals much higher than normal. Decide for yourself if you want to take this approach. If you do, and you’re setting goals in collaboration with your boss, be very clear on the fact that you’re creating large stretch goals, and that if you don’t reach them you won’t be penalized. Taking time for professional goal setting can give you a great return on your effort. This is not a one-time activity, but rather one you want to revisit to assess your progress along the way. 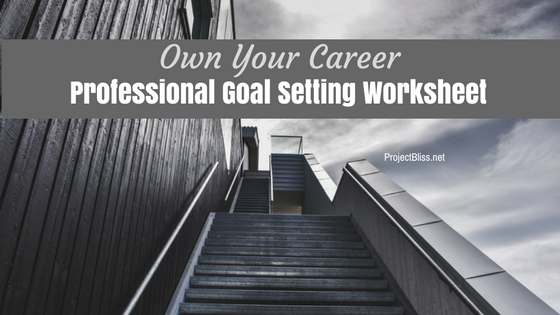 Incorporate professional goal setting as a part of your career, and you’ll be taking an active part in your professional and career growth. In addition to the guidance in this article, I’ve created a free workbook for you to use. Take ownership of your career! I’d love to know what goal you start working on first! Share in the comments below!! Thanks, Barry. And you’re right about it being tough when there are many projects to tend to. It’s important to be intentional about making time for it. The advice you were given is framed in a great way and easy to “get”. I think I’ll use that one with my daughter, even! Thanks for sharing that! I absolutely love the clarity you outlined with smart goals! LOVE the inspirational quotes!! Totally love Burns and Covey in #9 and #4!!! How one is a comedian and the other… Covey, yet they see the say the same thing! Begin with the end in mind! Thanks, Clay! I loved these quotes too! In addition to #10, I’m particularly fond of #7, too. All good ones, though! Excellent article!!! I really appreciate the examples of SMART goals. Thanks so much. Thanks, Leslie! I appreciate it!